Friends, today is a very important day for the dog park….we will find out if the City Commission will allow us to begin construction of Phase I. Also….we will have some good news to share with the City Commission….fingers and paws crossed!!!! 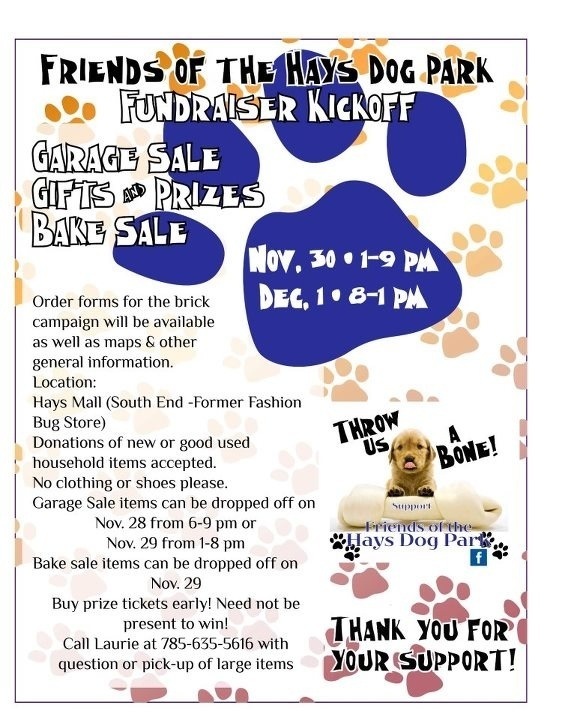 CALL FOR TREATS for our People and Pup Bake Sale to be held at the HRC K-9 Swim & Play at the Hays Aquatic Center on Saturday, August 17 from 11-1. Please bring your treats, clearly marked as for “people” or “pup” to the event a little before 11. Please package them in baggies and include a little of ingredients (some dogs are sensitive to certain ingredients). If you want to deliver your treats sooner, contact Cheryl Hofstetter Duffy on FB, at 785-635-3044, or at cduffy@fhsu.edu. Thanks!!! The Hays City Commission voted 4-1 tonight to allow the FHDP to pursue the park in phases. Phase 1 will cost about $33,000 and we already have $16,500! We are halfway there. I will post more about the phases at a later point–I have limited time tonight. What this means though is that we need to kick the fundraising efforts into HIGH gear and we really need your donations. Again, I will post more on that soon! BIG thanks to those of you who came out tonight to show your support and those of you who have worked hard. We have a lot of work ahead of us and we need to start twisting some arms!!!! Also, please send a note to Commissioners Schwaller, Phelps, Musil, and Mellick thanking them for their support! And finally…join us next Thursday for a fundraising planning meeting. I just recieved some awesome news! Laurie Mortinger called to tell me that Heartland Building Center in Hays has agreed to sell us fencing for the park for approx. $22,000!!! That is $50,000 less than the estimate that we recieved from the city! Tht lowers the total amount that we need to raise from $127,000 to $77,000!!! BIG THANK YOU to Heartland Building Center and Laurie!! !